MANILA, Philippines - After missing for 21 days, Ian Jasper Calalang, an 18-year-old University of the Philippines Diliman student, has allegedly returned home, a report by Philippine Collegian revealed. After missing for 21 days, Ian Jasper Calalang reportedly returned home. According to the report, Calalang’s mother Nenet confirmed that her son arrived at their residence in Greenpark, Cainta, Rizal province on Monday, February 1 at around 11pm. It appears that Calalang’s family refused to give details on what happened to him since he had gone missing on the morning of January 12, 2016. 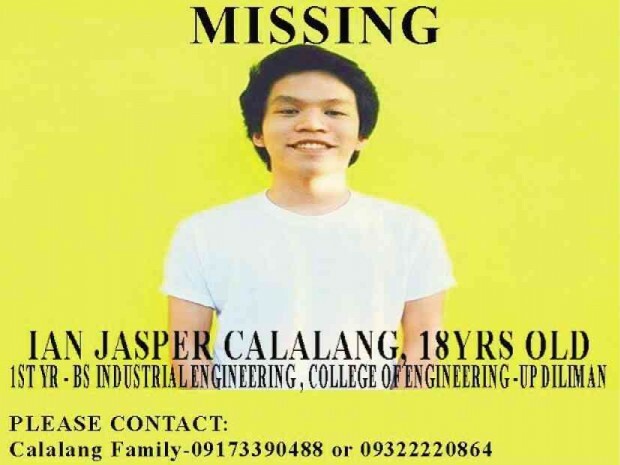 Calalang, an Industrial Engineering freshman student, was on his way to UP Diliman to register for the second semester on the day that he had gone missing. His parents received his last text message informing them that he had arrived at the UP campus at around 8:22 am that day. Since then, his family had not heard from Calalang. After failing to contact him, his family reported him as a missing person to the UP police as well as the local police of Cainta, Pasig and Quezon City. In her interview with Inquirer, Nenet that it was very unusual for Calalang not to contact them. “This is very unusual. He’s smart and responsible and he always texts me. Even when his cell phone was stolen or losing battery power, he would text me from a friend’s phone,” Nenet said. Days following his disappearance, Calalang’s parents requested to review the CCTV footage at Melchor Hall, College of Engineering and the College of Arts and Letters in order to verify if he was able to enroll. However, the video clips showed that Calalang didn’t show up in the campus.